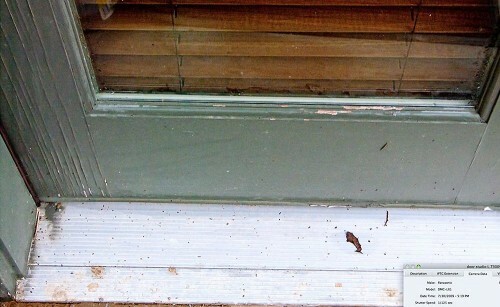 Do these doors appear refinished? 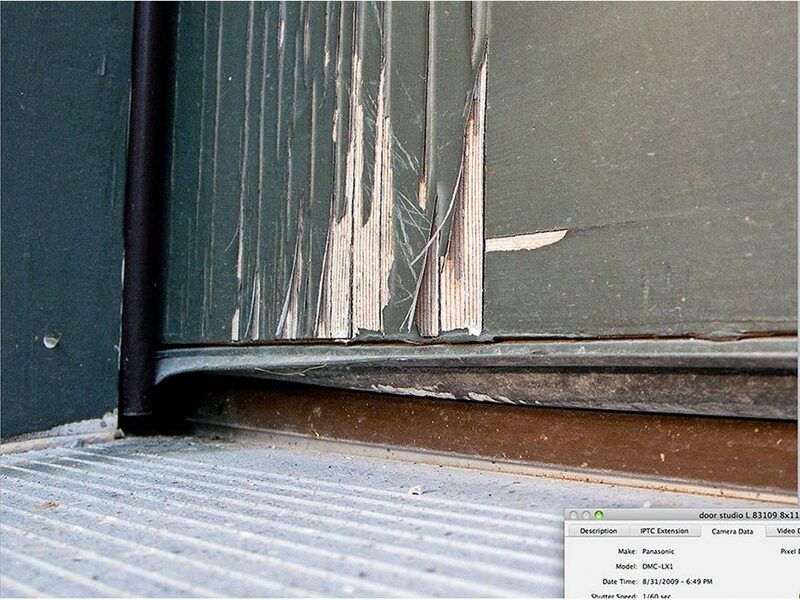 Our exterior doors began deteriorating shortly after we moved in, which we pointed out to the builders many times. 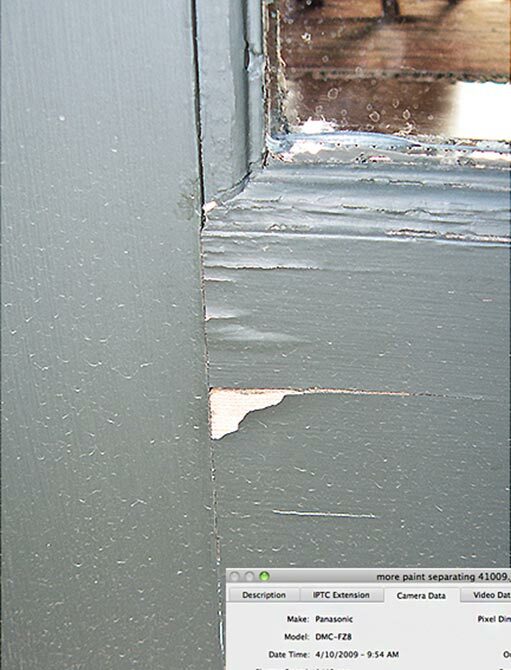 The builders did nothing from January through April, 2009, then the doors began cracking, flaking off paint and bubbling. In April, we had 2 separate paint store managers assess the doors, as well as the many other paint problems we had throughout the house before and after we moved in. 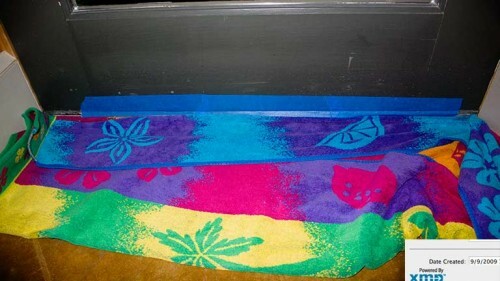 The doors, both managers said, were improperly prepared and painted. We scheduled a meeting with Beau Rutherford, Jim Rutherford, their painter and the manager of the store where they bought their paint. 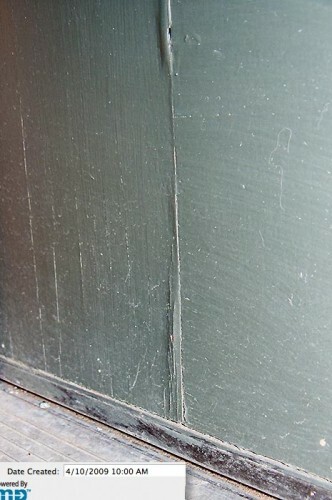 Regarding the doors, the manager stood by his analysis despite the Rutherfords’ blaming bad paint. We had an independent painter assess the doors. He said the same thing, plus, he said it appeared the doors were painted while weathered. 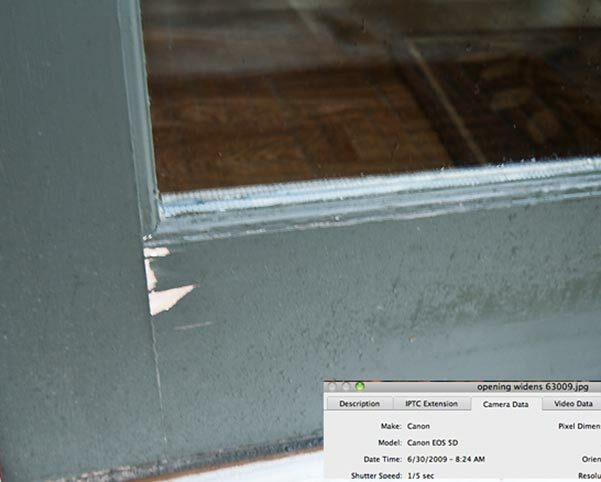 That comment started our photo search of the doors and exif data showing a timeline of the doors’ destruction. 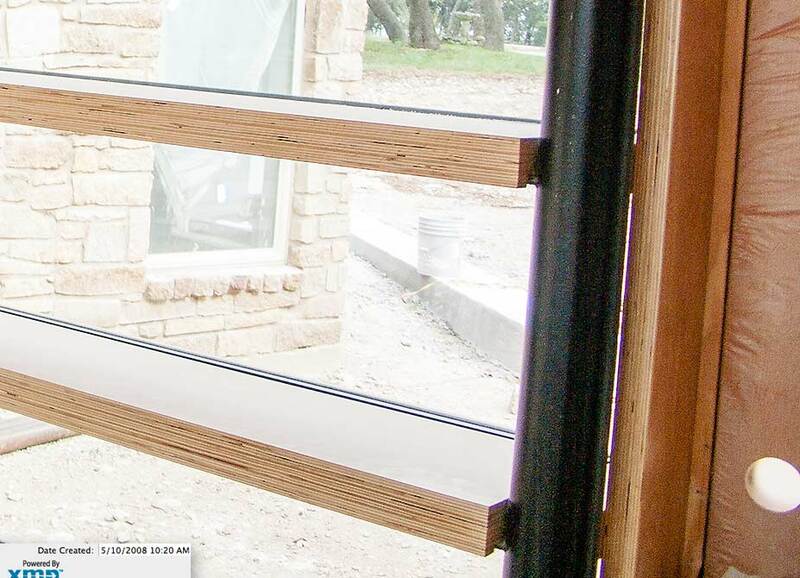 From installation to applying our selected paint, it took the Rutherford Custom Homes 9 months. 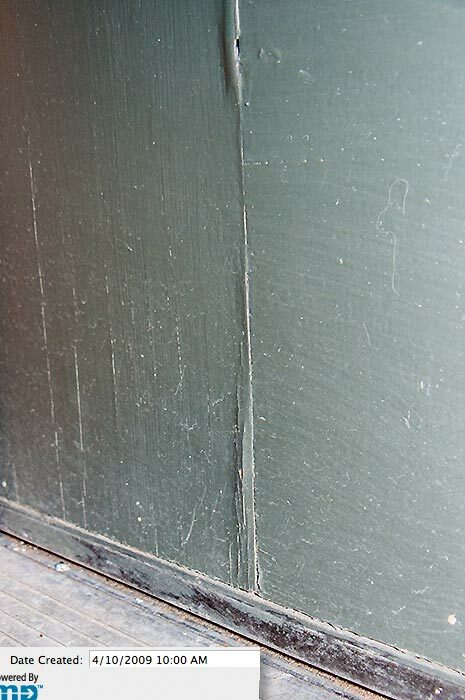 In between, the unsealed doors absorbed moisture, and after paint was applied, it quickly began to crack, bubble, flake, and fall off. Simpson Doors and supplier BMC West reps came out and inspected the doors. Jim Rutherford alleged he had a clear, exterior primer applied to the doors, but not to the full door, only to part of the door, he testified. 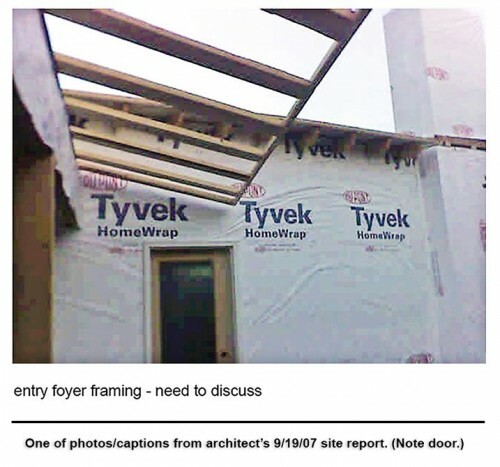 In 2 years, no documentation was produced of such primer purchased or applied. Both door reps saw the doors were not sealed on all sides, per warranty instructions stamped atop the doors. Plus, the timelines showed worse. 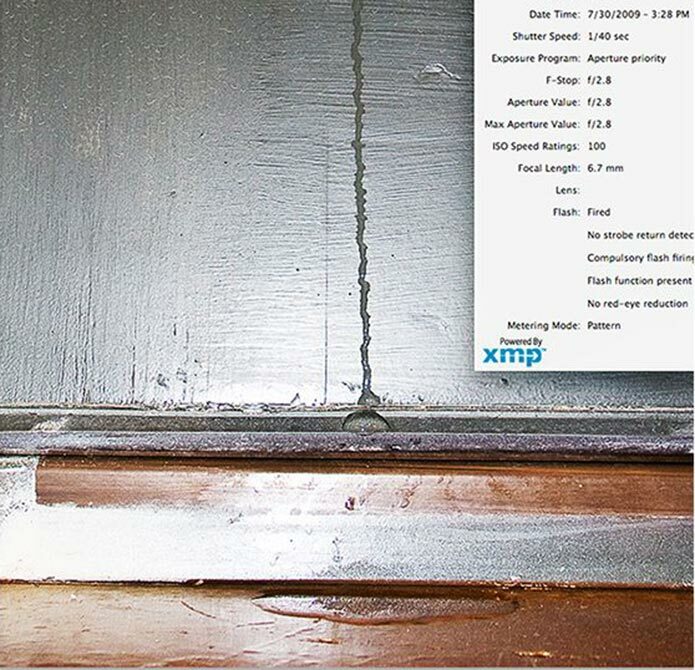 By not priming, caulking and painting the doors quickly and properly, the Simpson rep said any mechanical bond between a primer and paint would have been lost. 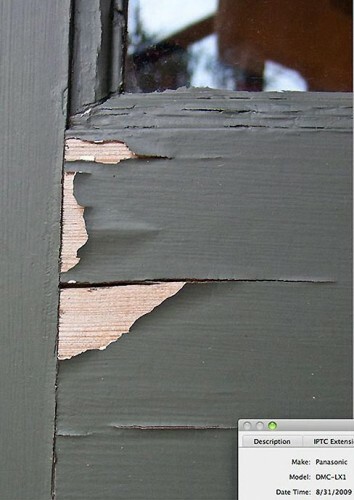 He said it only would delay the inevitable to repaint a door that exhibited wood rot. On-line experts we sought out, also said wood exterior doors should be sealed within days, 10 days to 2 weeks at most. 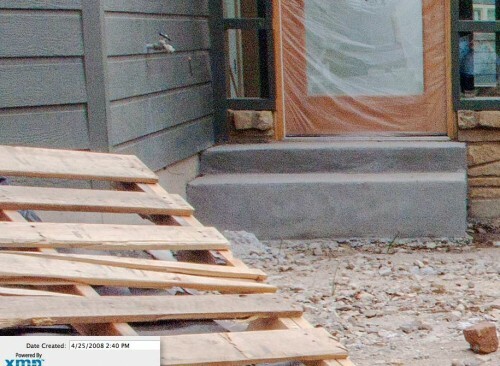 None said nine months (thirty-six weeks) Rutherford Custom Homes took. Plus, they did not paint all sides of the doors, voiding the warranty. Between the time the builder promised to refinish the doors, to our terminating Rutherford Custom Homes, they did nothing to the failing doors. 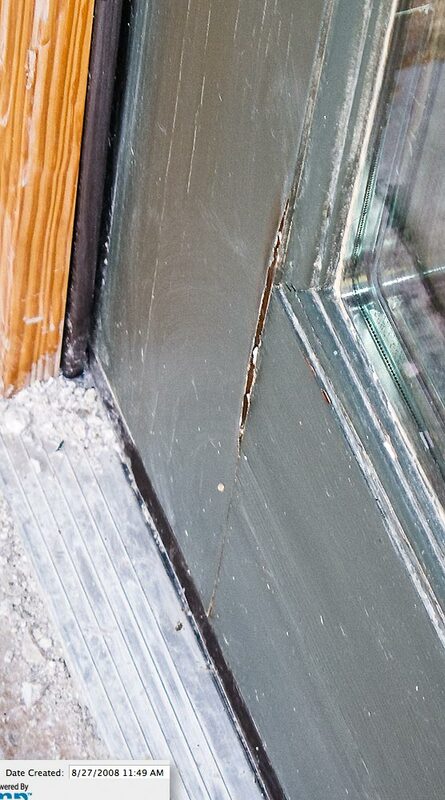 For 3 months after the meeting, no action on the doors, which followed 4 months of requests to fix the doors. 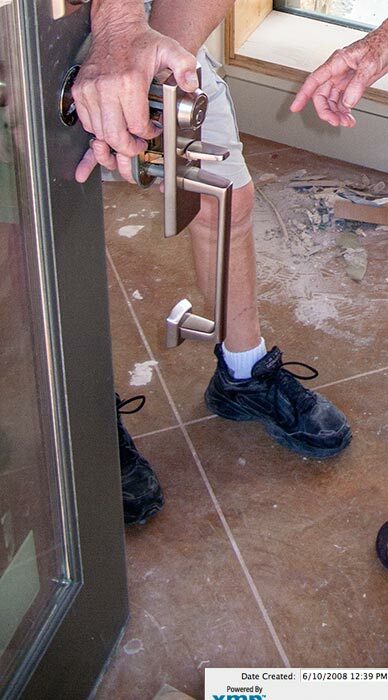 Thus, for 7 months, the builders did nothing for the doors. Before signing the contract, and after Rutherford Custom Homes had the plans for months, we specifically asked Beau Rutherford and Jim Rutherford if they had any issues with anything about the home. They said they had no issues. 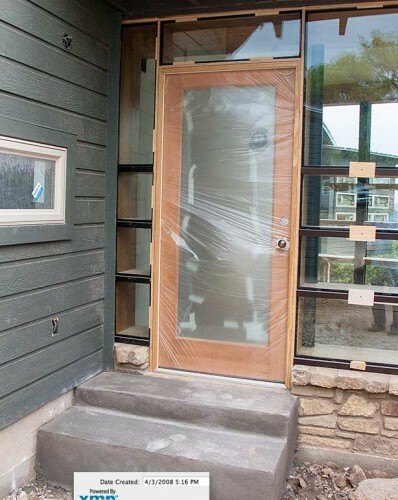 After signing the contract, Jim Rutherford asked us to switch to metal doors as he said wood exterior doors might not hold up against the weather. 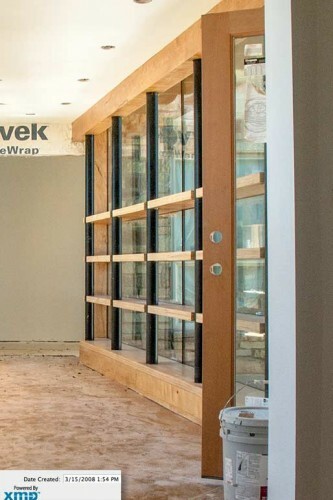 We chose to stick with the doors in the plans, which they’d already said they had no problems with. The fact that the Rutherfords brought this up (the doors), and only the doors, we thought meant they would take extra care with the doors. Beau Rutherford testified these doors were refinished by his visit 1 month earlier. This also was supposed to be a door just refinished by Rutherford Custom Homes. -- Testimony, James W. Rutherford, Jr.
For months, we pressed Rutherfords to replace fast-deteriorating doors. 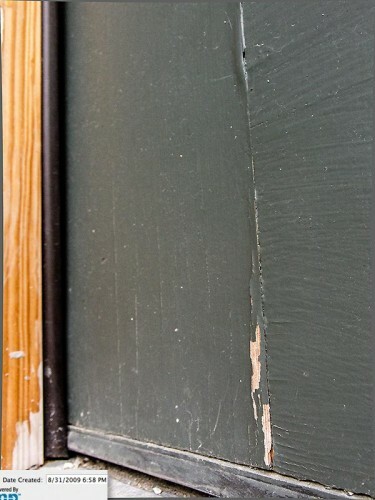 Rutherfords agreed to refinish the doors. Compare evidence with testimony under oath. 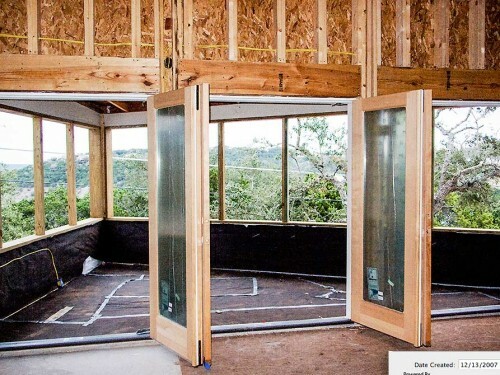 Beau Rutherford testified under oath that he had the doors refinished. Seam shed paint from unsealed front door. 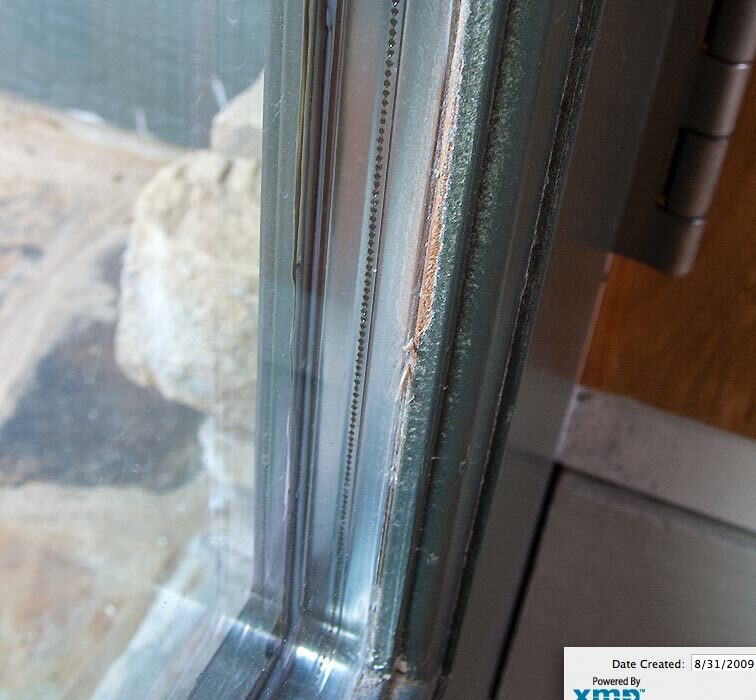 Water penetrated the improperly prepared exterior doors. 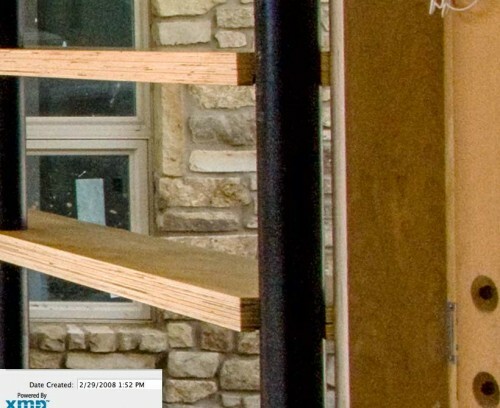 Doors were refinished by his last visit, Beau Rutherford testified. Photo was taken less than 2 months after that last visit. 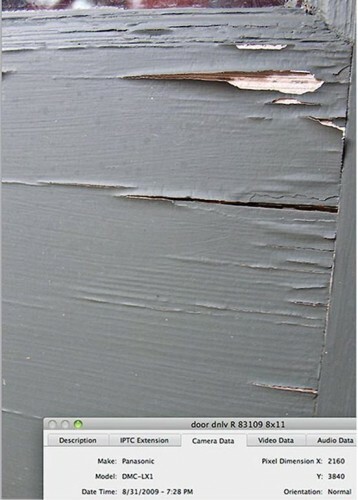 Q: Did you ever come to know of any defect in the paint on those doors? A: We had some issues with the paint on the doors. A: We redid the doors – repainted the doors. We repainted them, which we resealed them. Q: Is it your opinion today that that solved the problem? A: Up to the last point in time I saw the doors, yes. Beau Rutherford’s last visit to the home was July 8, 2009. The evidence and James W. Rutherford Jr.’s testimony clearly do not agree. 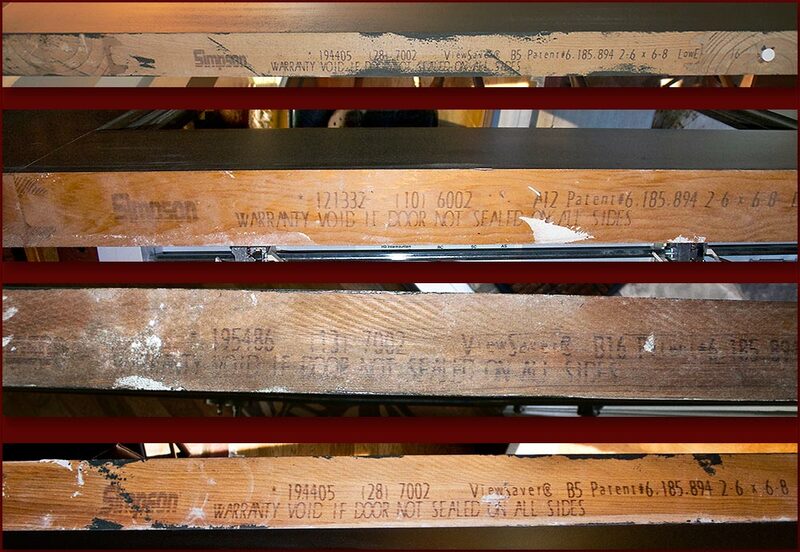 Photos from April, the month of the doors meeting, after which the Rutherfords said they would refinish the doors, through June, July and August show no refinishing whatsoever. In fact, Rutherford Custom Homes had no one come to our home to refinish the doors. Again, a Beau Rutherford statement under oath that never happened, and for which Beau Rutherford never supplied documentation. 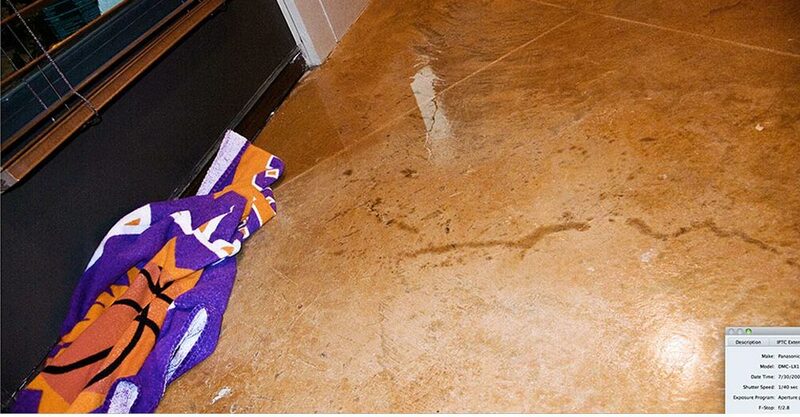 Water came through a door when the then-historic Texas drought broke. Drought-ending rain came through and around exterior doors. 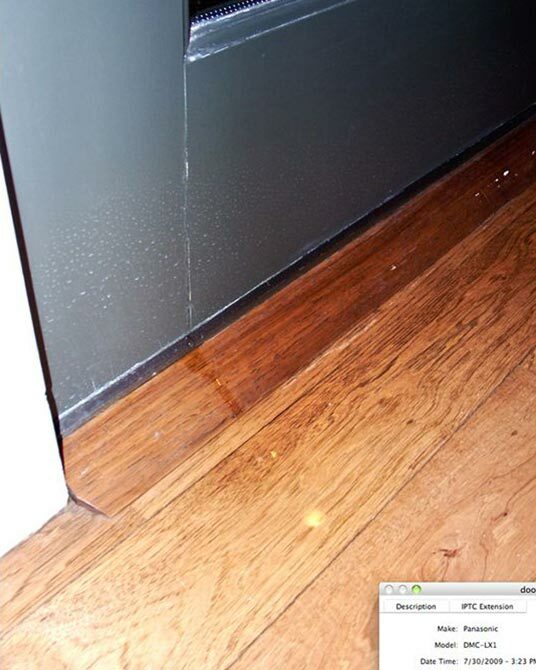 Rainwater trickled through door seam onto dining room wood floor. 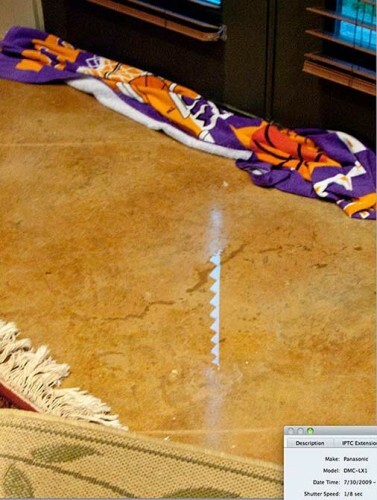 Towels needed for 5 leaking doors, more than 20 leaking windows. 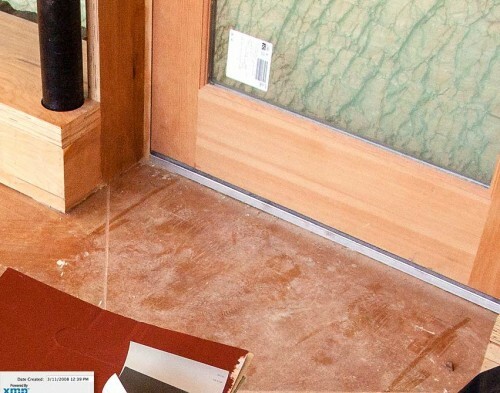 Continual water intrusion led to pulling up ruined wood floor in our Rutherford Custom Home. Water migrated into room from leaking doors in hard July rain. Builder Beau Rutherford testified he adjusted the strike plate. He did nothing else and the water continued to come through and around the doors. Water came through and around the exterior doors while also coming through more than 20 windows when the then-historic drought broke in the Texas Hill Country. 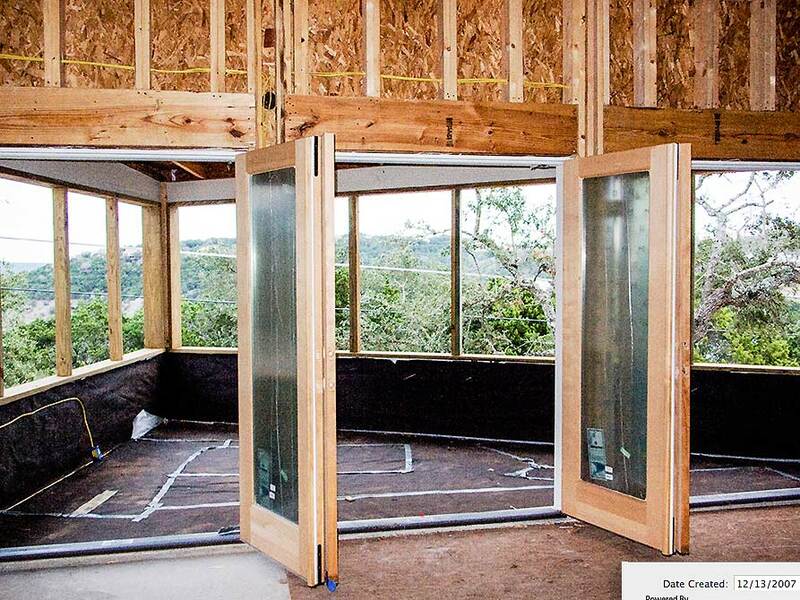 Architect's photo on another issue shows living room door installed by 9/19/07. Living room door inside, 9/23/07. 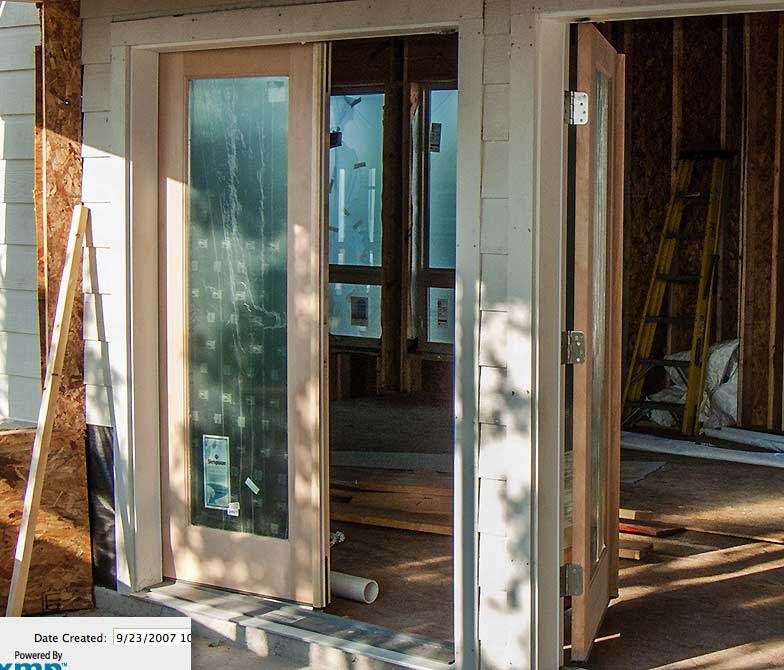 All exterior doors were installed this way. 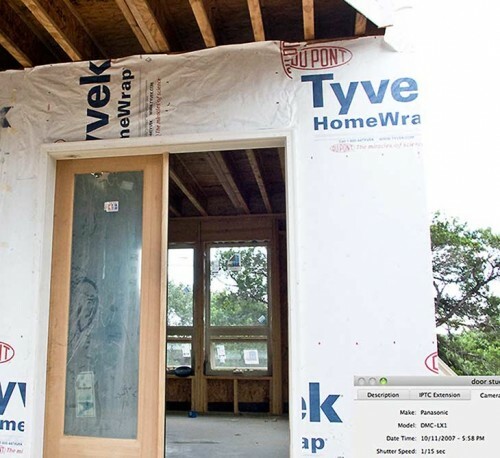 The final walls enclosing the home went up 6 months later. Studio door installed about 9 months before it, others, got green paint. 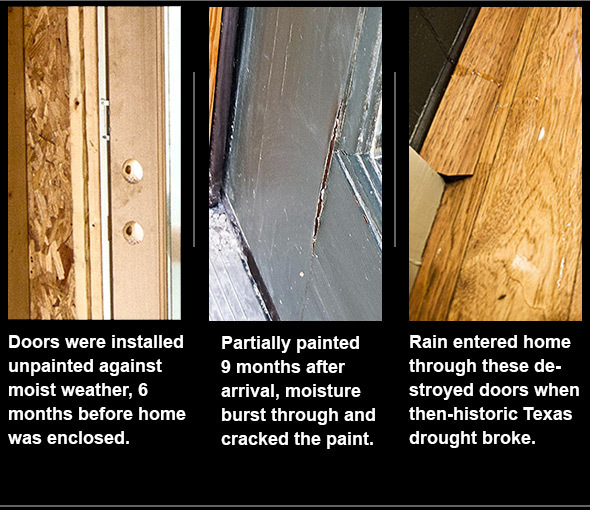 Porch doors also soaked up hilltop moisture, including morning clouds engulfing the house, before getting paint. Jim Rutherford testified they did not seal faces of the doors before putting them outside -- here, in October. 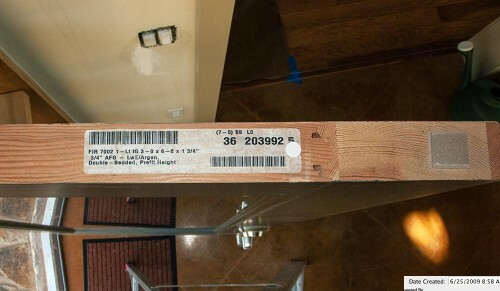 After 3 months, doors still were not sealed per Simpson doors warranty information, stamped atop the doors. December, 2007. Jim Rutherford testified that the day the doors were delivered (23 doors in the home), he had the edges of the doors sealed, not the faces of the doors, the edges only. As there was no visual evidence of any sealer on the tops of the doors (not then, not today), Jim Rutherford later said he had the painters use a clear exterior sealer. For 2 years, the Rutherfords never submitted to the court any documentation that they purchased a clear exterior wood sealer or had such applied to the doors. A: I was there the day they delivered them (the doors) and saw them. I also had the painter that day to seal all the exterior edges. Q: What does that mean, the exterior edges? A: Top and the two sides. The bottom is always sealed at the factory. Q. 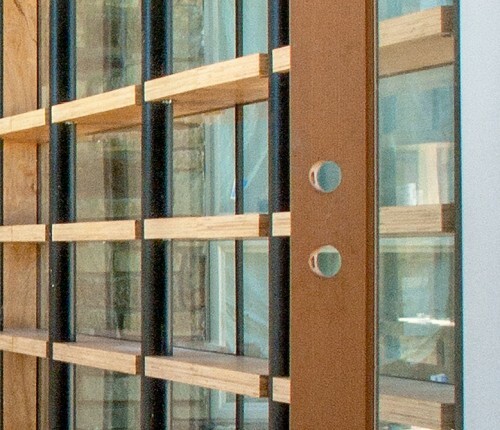 How about the face of the doors? Was it sealed, sir? A: No, it wasn’t because we didn’t have a — we didn’t have a paint selection. 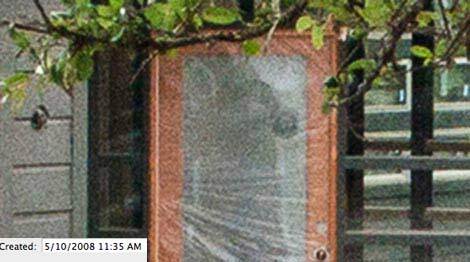 Q: Is it your belief that those doors were painted in December of 2007? 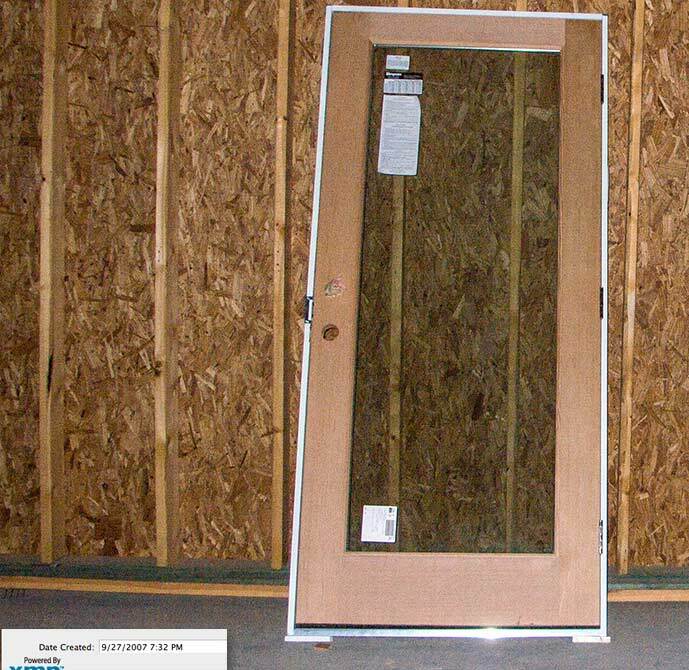 Front Door Timeline: Raw front door stored in garage -- 5 months before installation. 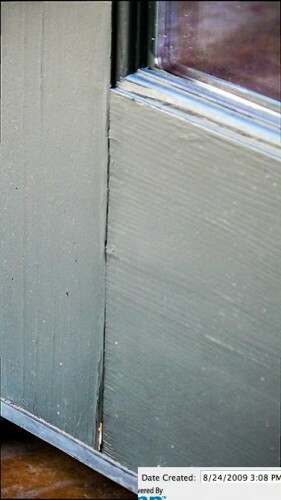 Front door was installed unpainted, 5 months after its Sept., 2007 arrival, 2 months after exterior paint was selected. Raw front door was taking in night-time moisture in Texas Hill Country. Some mornings, a cloud covers our hilltop homesite. 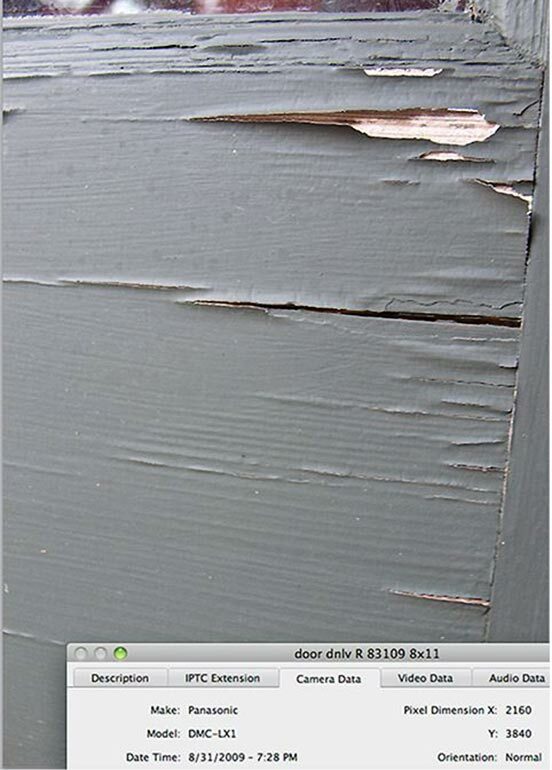 3 months after paint arrived, door still raw, outside walls were painted. 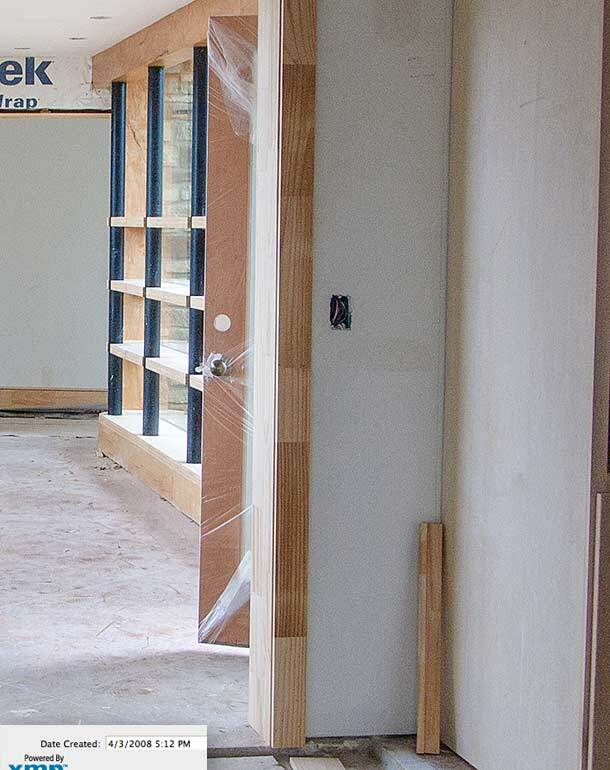 Foyer walls completed, 6 months after front door (still unpainted) arrived. 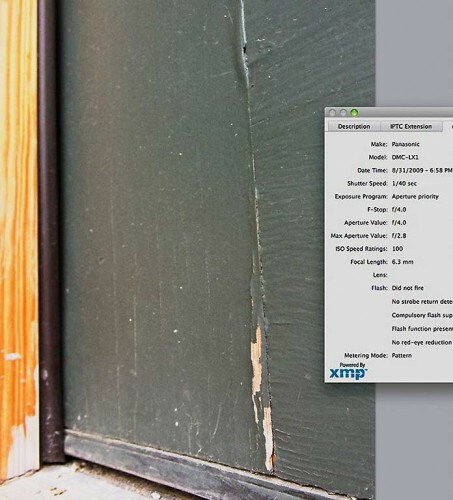 Jim Rutherford testified this door was painted 3 months earlier. It wasn't painted until 3 months after this photo. 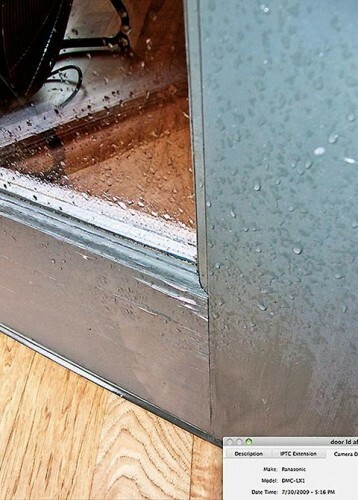 After more than a month of absorbing moisture, raw front door was sealed in plastic. 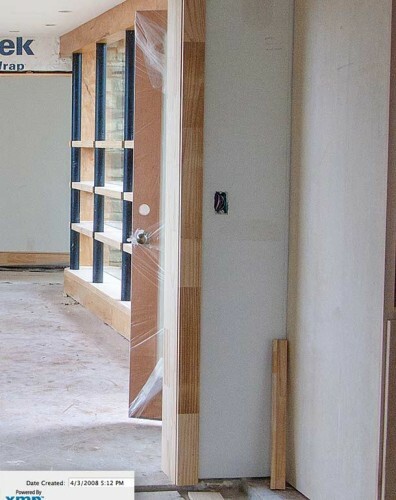 The tightly sealed front door. Moisture was still sealed in, coming up on a month. Front door still sealed in plastic. At this time, the Rutherfords were having the interior painted before the exterior doors. Exterior foyer framing was painted before the exterior doors. Door painted, not sealed, 5 months after paint selection. 2 months after release from plastic, pent-up moisture burst through seam. Cracks appear in front door, refinished during construction. Refinished during construction, the seam reopened 8 months later. After another 4 months, paint opens to bare wood. Paint's bubbling along glass worsened. 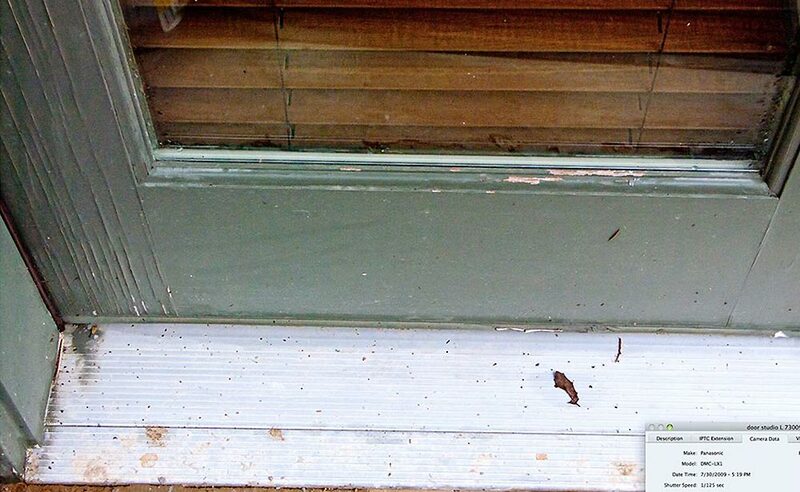 2 paint store managers, 1 painter said it appeared the doors were painted when weathered. Builder Beau Rutherford testified the doors were refinished 2 months before this photo. 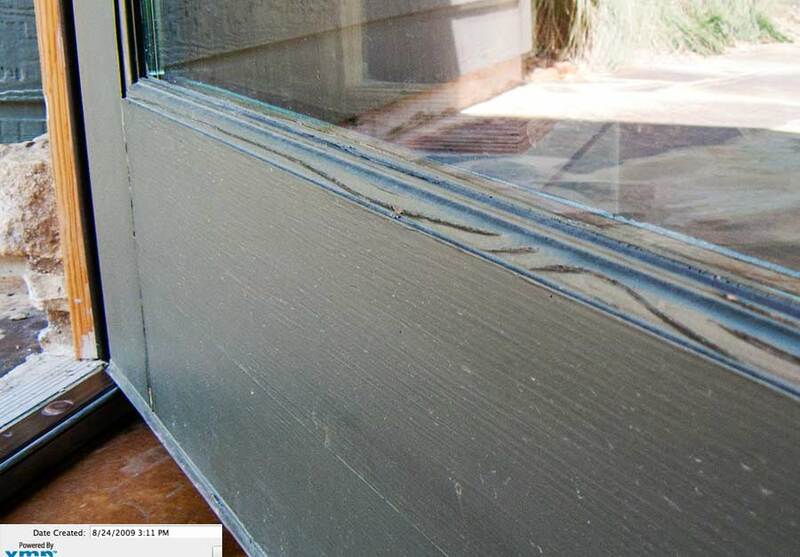 Weathered front door losing paint inside also, along glass. When the drought broke, rain came in through and around the front door. The front door, 4 months after installation. 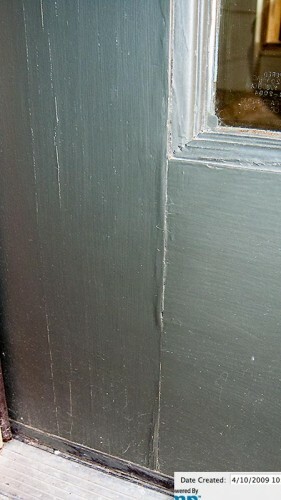 Not all parts of the door were painted and sealed, voiding the warranty. 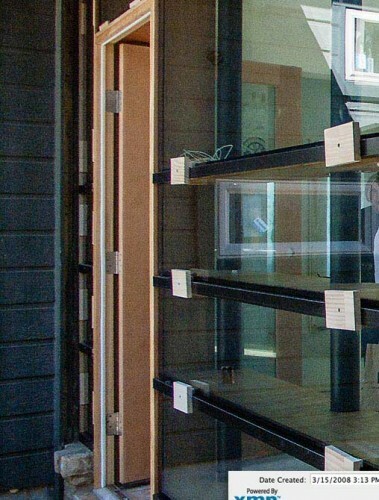 After Simpson rep inspected damaged doors, BMC West did not give us free replacements. 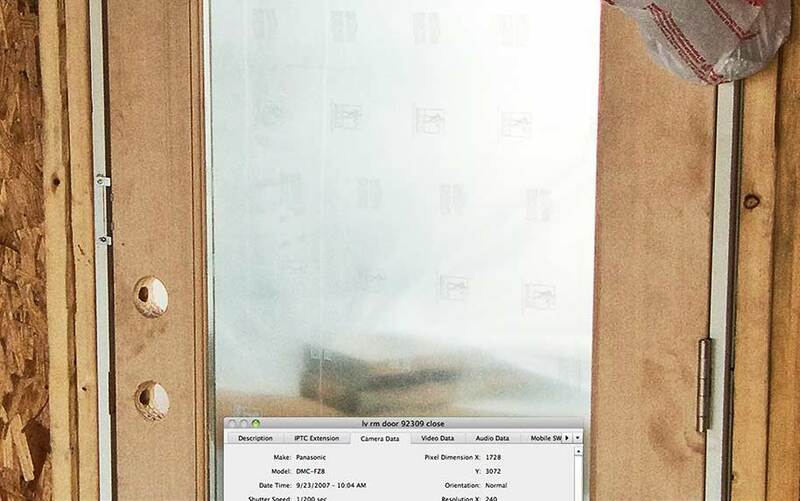 Builder didn't seal doors, voided the warranty. The photographic evidence and James W. (Jim) Rutherford Sr.’s testimony do not agree. 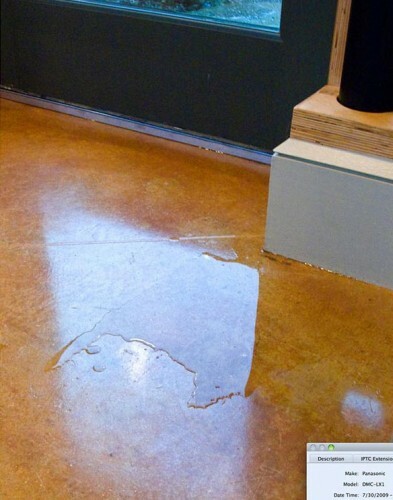 Who’s fault was it the unsealed doors cracked, split and allowed rainwater to pass through closed doors? 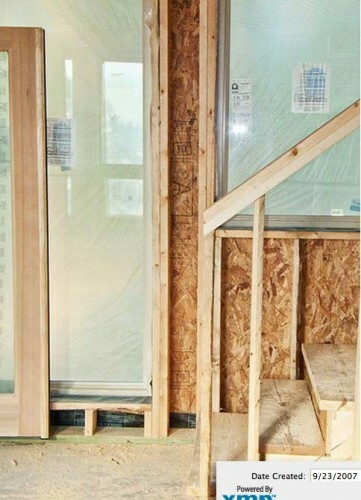 And they even came up with a redesign of the house to mitigate the water intrusion caused by the destruction of the doors. Q: Do you think awnings or another covering over the doors and windows would have mitigated water intrusion?